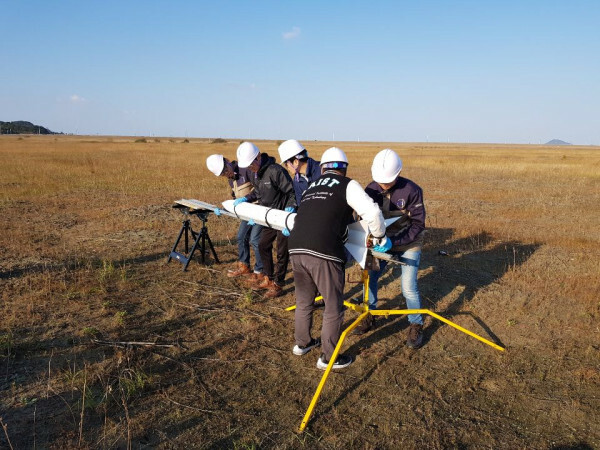 Professor Sejin Kwon from the Department of Aerospace Engineering and his team succeeded in launching a science rocket, named ‘Woorisae II’ at Saemanguem reclamation. This rocket was developed in collaboration with the Satellite Technology Research Lab (SaRTec). The test-firing was conducted at 10:43 am on Sunday October 28, 2018 (35°N 42’ 06” 126°E 33’ 36”, Radius of 0.6NM). This launch was the follow-up to the previous launch that was cancelled due to not gaining approval for using the airspace. Professor Kwon’s team put a great deal of effort into securing the land for the rocket launch. As a result, they got approval from the Saemangeum Development and Investment Agency for the land and the Ministry of Land, Infrastructure and Transport for the use of the airspace. 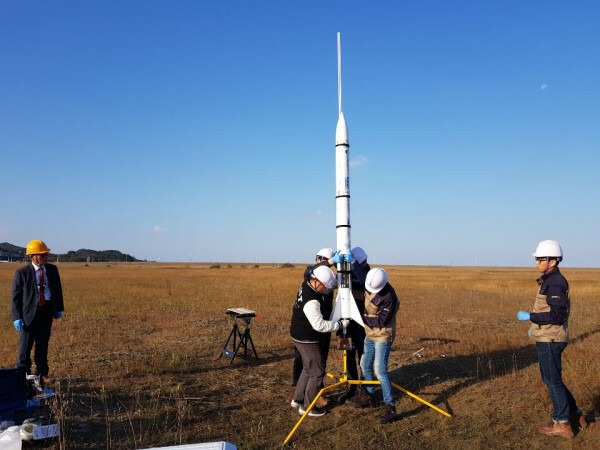 The Republic of Korea Air Force and United States Air Force also approved the use of the airspace for the launch of the science rocket for research purposes. Woorisae II is 2.2 meters long with a diameter of 20cm, and weighs 13kg without a payload. The rocket is powered by a hybrid rocket with hydrogen peroxide oxidizer producing 100 kg of force. The Woorisae II sounding rocket was designed to burn for five seconds and then continue inertial flight for 20 seconds. The target altitude of Woorisae II was set at 3,300 feet to comply with the airspace approval. The team developed the core components, including a hybrid rocket propulsion system, flight computer and parachute recovery system, as well as a ground control station. The flight data was transmitted to the ground station and recorded to onboard computer memory. When a malfunction occurs during the flight, Woorisae II was designed to terminate the power flight for safety by shutting the propellant valve and deploying the recovery parachute. All the rocket subsystems and components were developed and supplied by domestic startup companies such as INOCOM and NARA SPACE TEHCNOLOGY. Generally, sounding rockets reach an altitude beyond 30km and are widely used for testing rocket engines and reentry materials as well as for conducting microgravity experiments. Instruments for atmospheric science can also be installed to measure fine dust and high altitude atmosphere. Besides these science and technology purposes, most advanced spacefaring countries have sounding rocket programs to train and educate young people in the field of space science.